Original cast member Lea Michele returns for her fifth season as Rachel Berry. 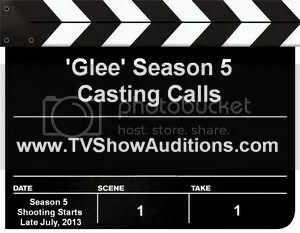 Ryan Murphy Productions is gearing up to begin shooting season five of the smash hit Fox series “Glee”, and the casting directors have sent out the first casting calls. They are auditioning talent for four new recurring roles, one male and three females. Extras for the series will be cast starting late July and will continue to be hired on an ongoing basis for the 22-episode season. The show was picked up for season five and six on April 19, 2013 for a total of 44 additional new episodes. Shooting will begin on Monday July 29th and will continue through early 2014. The show is a single-camera setup that films at Paramount Studios in Hollywood, California. Beautiful Dianna Agron plays cheerleader Quinn Fabray on the FOX series “Glee”. The casting directors for 20th Century Fox Television’s musical series “Glee” are casting new recurring guest starring roles for the show’s 3rd season, which will begin shooting in late June, 2011. The extras casting director is also seeking talent above 18 years of age who can play high school age students of all types. Extreme nerds and cheerleaders in the same age range are especially needed.